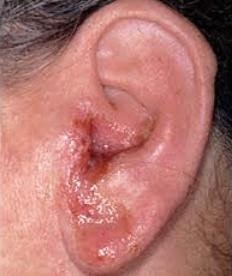 This is a disorder of the ear canal, between the outside of the ear and the ear drum. It is usually due to infection, and can be acute or chronic. 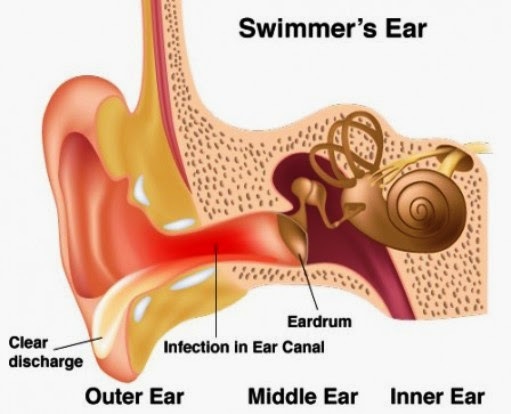 It is also sometimes called 'swimmer's ear'. Acute otitis externa, (or OE) is a bacterial infection commonly caused by the bacteria staphylococcus, streptococcus or pseudomonas. These are present in stagnant water that can 'pool' in the ear canal, often trapped behind wax. Chronic OE can be caused by these same bacteria but also by other factors such as eczema, chronic use of cotton buds to clean the ears, allergy or chronic drainage from middle ear problems such as otitis media. What Are The Signs And Symptoms Of Otitis Externa? The usual first sign is that the ear(s) feel full and itchy, and this is followed by the ear canal swelling up and becoming painful. If the ear canal becomes so swollen it closes up, then the affected side of the face may also swell and the jaw may become painful to open fully. Your GP will look inside your ears with a special light called an auroscope, and is usually able to make the diagnosis on the spot. Removal of any foreign body stuck in the ear is a specialised job and should only be attempted by a trained doctor. It is only rarely, e.g. in situations where your doctor is unsure of the diagnosis or where treatment does not work, that a specialist opinion will be sought. The key to all treatments of OE is to keep the ear dry. This can be with ear plugs when swimming or showering, or a cotton plug with vaseline on the outside of it. This is followed by avoiding scratching the ear, which only prolongs the problem, and by using prescribed antibiotic and anti-inflammatory ear drops on a regular basis for several days. A specialist may sometimes be needed to micro-suction out any debris, wax and bacteria from chronically infected ears if there is no improvement with local drops or sprays after two or three weeks. Oral courses of antibiotics may also be required if there is only a limited response to the topical drops after several days of treatment, and it must be remembered that an over-use of such drops can lead to the emergence of drug-resistant organisms and/or fungal overgrowth. The vast majority of OE cases respond quickly and easily to a combination of keeping the ear dry, avoiding scratching it and using the appropriate ear drops. However, any patient that does not respond to such simple treatment, or in whom there is a persisting foul-smelling ear discharge, should always be referred for specialist assessment by an otologist (an ear specialist). 1. Reduce the ear exposure to water - this is vital. If you must swim, use ear plugs and dry the ear afterwards by using a warm hair dryer held at arms length. 2. Do not use cotton buds in the ear, and resist the temptation to scratch it. 3. Try to keep your ears wax-free. This may involve regular checks from your GP or practice nurse for regular ear syringing. 4. Simple ear drops can be made from a mixture of rubbing alcohol and white vinegar in a 50:50 ratio - this is cheap and easy to make, and has antibacterial and evaporative properties. 1. Have you had any discharge from your ear? 2. Do you swim regularly? 3. Do you regularly use cotton buds to try to clean your ears? 4. Have you had ear problems in the past? 5. Do your ears itch? 1. Does otitis externa make it more likely I will become deaf in later life? 2. Should I clean my ears at all? 3. Do I need to give up swimming? 4. Should I be treating myself before seeing a doctor? 5. Does micro-suction of ear debris hurt?